Hey there! Thanks for dropping by Aletheia's Herald! Take a look around and grab the RSS feed to stay updated. See you around! 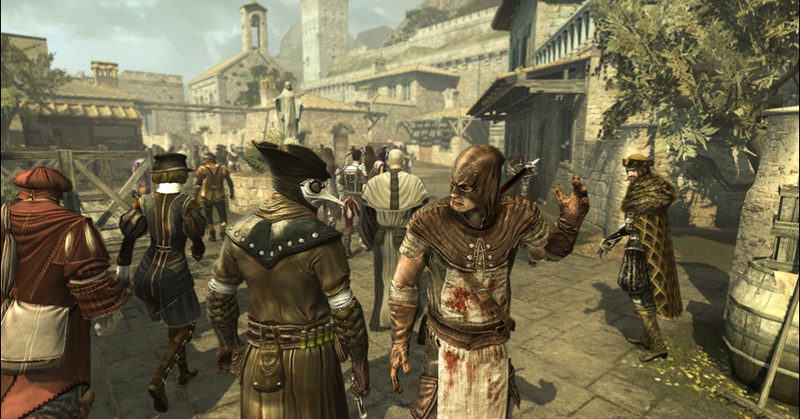 I recently reviewed the latest in Ubisoft’s line of Assassin’s Creed games, Assassin’s Creed: Brotherhood, for DigitalReviews.net. My full text review is up at their website, but here’s what I thought in brief. Assassin’s Creed: Brotherhood is easily my favorite PS3 action game of 2010, up against games like God of War 3, Just Cause 2, Uncharted 2, and many others. I haven’t played some of the major Game of the Year candidates or played them in their entirety, such as Call of Duty: Black Ops or Mass Effect 2 (though ME2 technically came out just last week for PS3), but from what I have played Assassin’s Creed: Brotherhood is my Game of the Year 2010 choice. I freaking love this game. Essentially, you play as Ezio Auditore di Firenze, a turn of the 16th century Italian assassin and leader of the secretive assassin’s guild. After the events of Assassin’s Creed 2, which I’m not wholly familiar with, a ruthless villain, Cesare Borgia, throws a wrench into Ezio’s life and begins to take over Rome along with the rest of the Borgia family. 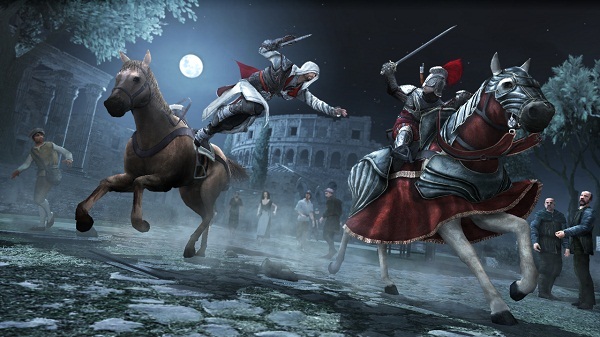 Having lost his estate at Monteriggioni, Ezio has to recruit thieves, mercenaries, courtesans, and fellow assassins to rebuild his base of power, get revenge on Cesare Borgia, and free the city of Rome from the corrupt Borgia’s influence. It sounds like a simple story, but the nuances in its telling turn it into something engaging. Add to that a series of hidden objectives and storyline components that weave their way into a modern day conspiracy theory story and there’s quite a bit to be told. 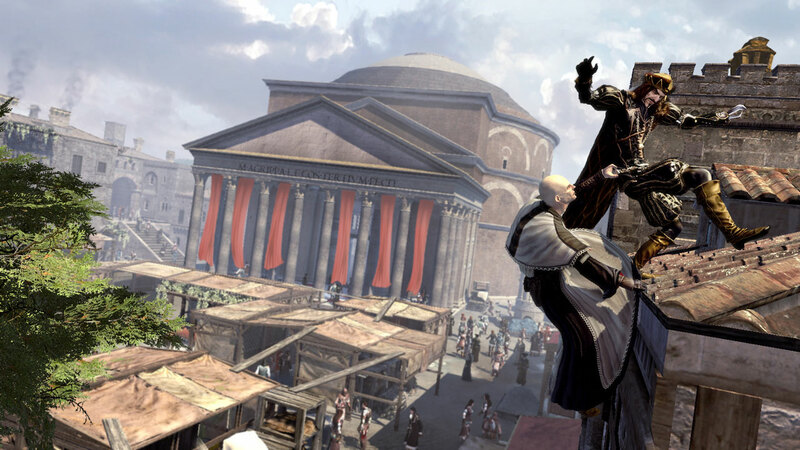 The action in Assassin’s Creed: Brotherhood is essentially flawless. You run around by holding R1, faster if you also hold X, and Ezio automatically makes the complicated Parkour motions to get you from place to place. It’s automated enough to take your mind off of making a constant series of complicated jumps and climbing maneuvers, but still allows for enough player interaction to permit failure. I never felt like there was too much or too little handholding, so I was engaged with the exploration element of this game constantly. Combat isn’t complicated, either, relying instead on finesse and timing more than anything else. There are blocks, parries, disarms, and about a dozen secondary weapon types to allow you to fight the way you want to fight and to handle a myriad of different kinds of opponents. New to Assassin’s Creed: Brotherhood is the kill streak system, where you can slaughter one opponent after another so long as you stay within range of your next opponent, time your swings properly, and parry-kill anyone who tries to hit you to break your combo. It can result in spectacular streaks of one-shot killing a dozen opponents in a matter of seconds and it’s extremely satisfying when you pull it off. 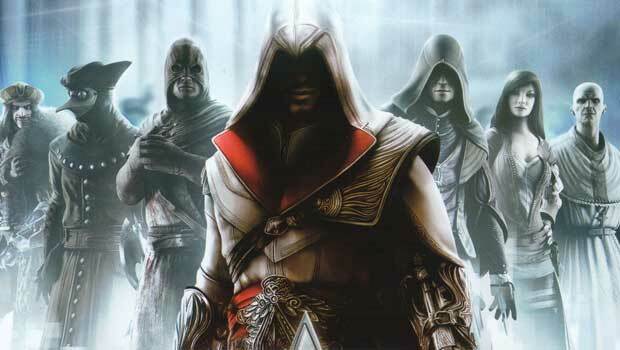 Multiplayer in Assassin’s Creed: Brotherhood is addictive, intense, and incredibly innovative. There are numerous modes, from free-for-all Wanted mode to team-based Manhunt and recently-added Chest Capture. The catch is that you can never tell the difference between an NPC and a human player, so long as they act in cognito. It’s unlike any action multiplayer I’ve ever experienced and I highly recommend it to anyone interested in an extremely challenging, edge of your seat multiplayer game. Occasionally, Ezio wouldn’t respond the exact way that I wanted him to, resulting in me falling to my death, failing to block or parry a critical attack, or doing something else frustrating. Beyond that, there were a few bugs and some lengthy load times here and there. At the end of the day, I found that the flaws in Assassin’s Creed: Brotherhood were minor, completely washed out next to the strengths of this game. For the full review and more specific details on my Assassin’s Creed: Brotherhood experience, check out my article on DigitalReviews.net. Like Aletheia’s Herald? Consider a donation! Enter your email address to subscribe and get Aletheia's Herald updates by email. This work by Jake Vander Ende is licensed under a Creative Commons Attribution-ShareAlike 3.0 Unported License.